1" (25.4 mm) Diameter Rod, 2' (609 mm) long with Tripleye and with 7/8" (22.2 mm) clevis bolt. 1" (25.4 mm) Diameter Rod, 2' (609 mm) long with Twineye and with 7/8" (22.2 mm) clevis bolt. 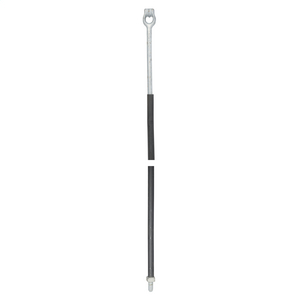 1" (25.4 mm) Diameter Rod, 3' (914 mm) long with Tripleye and with 7/8" (22.2 mm) clevis bolt. 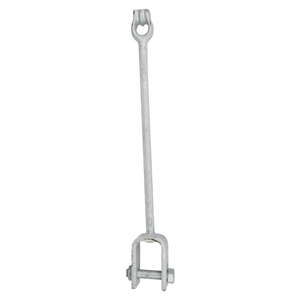 1" (25.4 mm) Diameter Rod, 3' (914 mm) long with Twineye and with 7/8" (22.2 mm) clevis bolt. 1" (25.4 mm) Diameter Rod, 6' (1828 mm) long with Tripleye and with 7/8" (22.2 mm) clevis bolt. 1" (25.4 mm) Diameter Rod, 6' (1828 mm) long with Twineye and with 7/8" (22.2 mm) clevis bolt. 0.75" (19.1 mm) Diameter Rod, 2' (609 mm) long with Tripleye and 0.75" (19.1 mm) clevis bolt. 0.75" (19.1 mm) Diameter Rod, 3' (914 mm) long with Tripleye and 0.75" (19.1 mm) clevis bolt. 0.75" (19.1 mm) Diameter Rod, 6' (1828 mm) long with Tripleye and 0.75" (19.1 mm) clevis bolt. 1" (25.4 mm) Diameter Rod, 10' (3048 mm) long with Thimbleye with protective plastic tube. 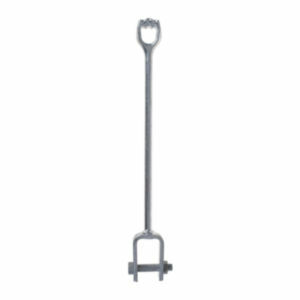 1" (25.4 mm) Diameter Rod, 10' (3048 mm) long with Tripleye with protective plastic tube.